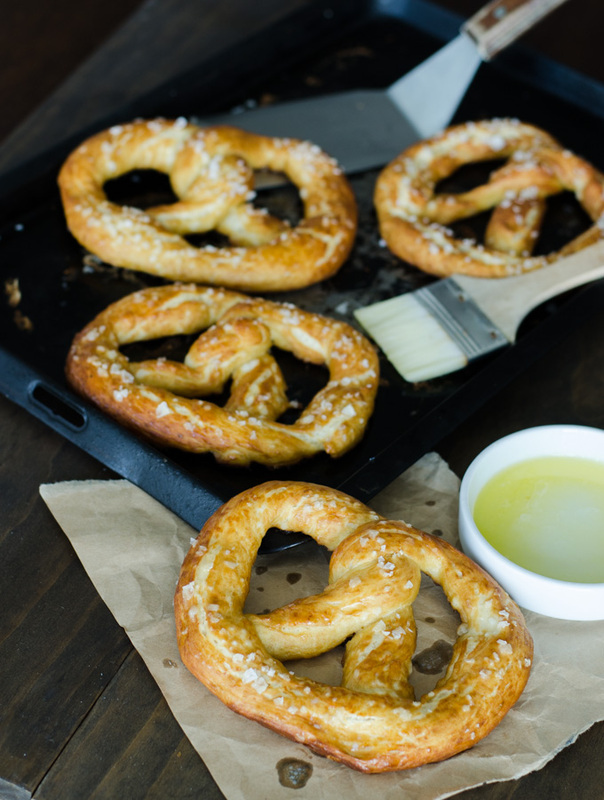 Do you know how easy it is to make pretzels at home? Ever since I found out, I’ve been obsessed with these. What started as a way to amuse myself come Oktoberfest has turned into an almost pretzel factory-like operation. I almost debated saving this post for October next year, but I think you deserve to enjoy pretzels all year round. Like now. Because they’re perfect snacking size and oh-so-delicious. Great for sundowners with beers, and it’s almost summer so there’s bound to be lots of beers. Have I told you that I don’t drink beer? I don’t. But I’ll happily eat a pretzel and watch others drink beer while downing an Aperol Spritz. I feel like I’ve been let in on some big secret and now I have to share it with everyone. I mean there are whole shops dedicated to pretzels, my sister being partial to Auntie Anne’s, so I just assumed that it was something that required some sort of commercial oven or expertise. In actual fact, they require about an hour of your time – ok maybe a bit more, but you can watch TV while the dough is resting. Pretzels are traditionally dipped in a lye solution to give them that trademark dark brown shiny finish. But forget about that for now, because unless you want to go and source some rather corrosive, somewhat dangerous food grade lye and use thick rubber gloves in your kitchen (a thing that seems counterintuitive when making something to be eaten) – that’s a problem for later down the track when you are all consumed by the quest to make that perfect pretzel. For now, this method will do. They’re made by dipping pretzels in a warm baking soda solution which is the next best closest easy substitute. If you can’t be bothered with the baking soda solution, that’s fine too. They’ll just be more bready, slightly less chewy and won’t bake into the golden brown colour. Just brush with an egg wash, sprinkle with salt as usual and you’re good to go. These don’t keep well – like all bread, they get hard, so eat while still warm or as soon as possible. I’ve put some in the freezer and will report back on whether they freeze ok.
Heat the milk until just warm to the touch - too hot and you'll kill the yeast. In the bowl of your stand mixer with the dough hook attachment, combine flour, yeast, sugar and melted butter. Knead on medium until the dough comes together, about 6-8 minutes. Add flour a tablespoon at the time, if needed, it should form a ball that comes away from the side of the bowl. Set the dough aside to rise in a oiled bowl for at least 40 minutes. - I tend to turn the dough out on the bench, oil the KitchenAid bowl and put the dough back into the bowl. Make the pretzel bath solution by heating the water in a pan wide enough to fit a whole pretzel.When small bubbles appear in the water, add bicarb soda and stir to combine. Leave the solution on low heat while you make the pretzels. Preheat your oven to 220C and generously grease two baking trays. 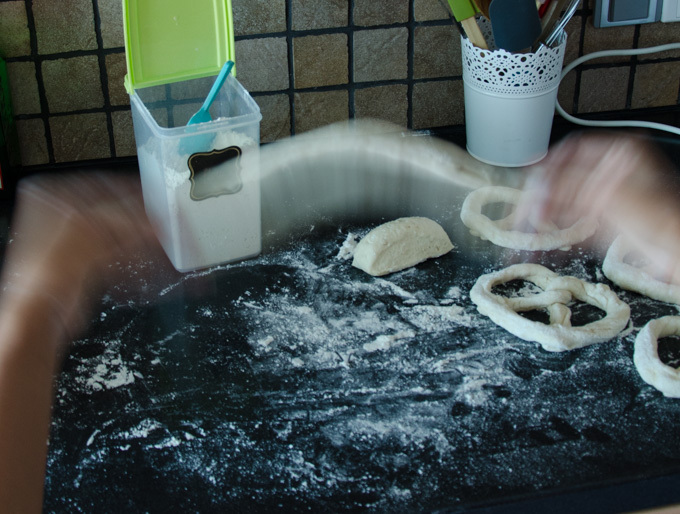 Turn the pretzel dough out onto on a floured bench. Try to handle the dough as little as possible at this stage as kneading the dough will make it harder to stretch into the long sausage shape. Adjust the dough to form a sort of log shape, then cut into roughly 100g pieces. Making sure the bench is floured, roll and stretch each piece with the palms of your hands, holding the ends and swinging the dough up and down to stretch it until approximately 60cm. 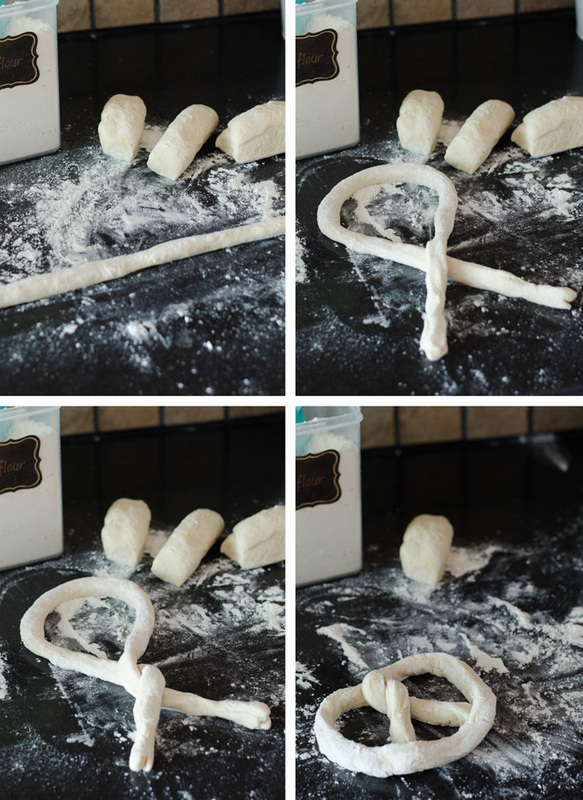 Form each rope into a pretzel shape - you can tuck the ends either over or under the loop bit. Once you have finished making all the pretzel shapes, one-by-one carefully place each pretzel in the pretzel bath (which should still be under low heat) for about 30 seconds - the longer you leave it, the bigger they expand. Remove with a slotted spoon and place on a greased baking sheet. Sprinkle with salt flakes and bake for 12-15 minutes. Brush with melted butter as they come out of the oven. 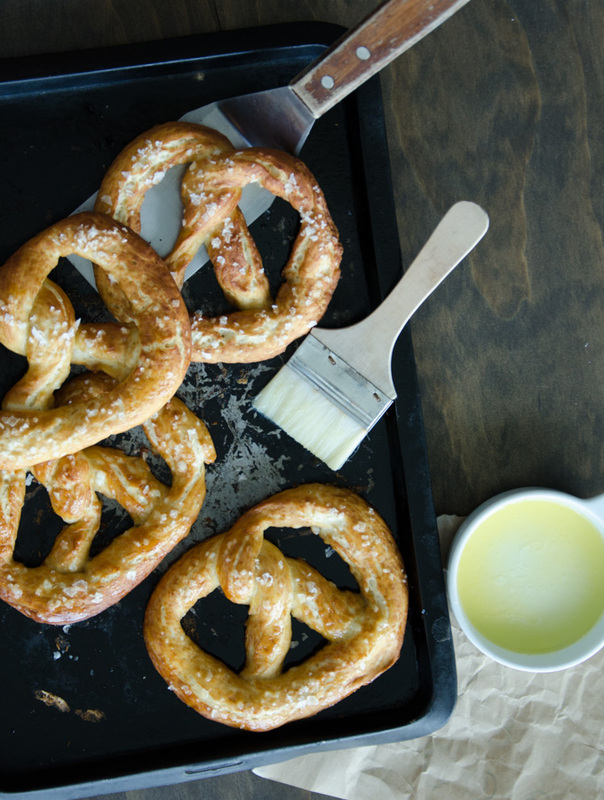 **There is no substitute for lye if you’re looking for an authentic laugenbrezel. If you insist on using lye, you need to find food grade lye in powder form not liquid form. It is considered a dangerous chemical and from my searches, impossible to find in Australia. Even if you do manage to find it, it may not be able to be posted. If you do manage to find it, please drop me a line in the comments section because I’m very tempted to try it. If you want the next best thing, which is a bit more of a hassle, you need to used baked baking soda. Yup, you read that right. Essentially, you need to bake 1 cup of baking soda at a low temperature for about an hour, turning sodium bicarbonate into sodium carbonate. They did! Not quite as good as warm from the oven, but I just brushed with a bit more butter and reheated in a moderate (160-180C) oven.